“Vice” is a bold film that leans heavily on dark humor and gonzo flair as substitutes for cold, hard facts to tell the story of one of the most secretive political figures of modern times. Adam McKay’s new film mimics his earlier Bush-era takedown movie — “The Big Short” — which also uses satire and nimble storytelling to provide a sort of “idiots’ guide” to the global financial crash of 2007–08. “Vice” attempts to do the same with mixed results for the Bush/Cheney regime and its highly destructive foreign adventures. And while the results are often hit or miss, this film is informative, entertaining, sometimes hilarious, and never dull. The film starts with the attack on the World Trade Center, allowing McKay to signpost Cheney’s brazenly opportunistic power grab in Washington while the president was away reading children’s stories with a bunch of school kids. It then rewinds to show him as a young alcoholic ne’er-do-well in 1960s America, a man who agrees to straighten himself out when his smart, ambitious, nerves-of-steel wife, Lynne (Amy Adams), threatens to leave him. 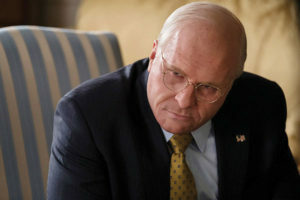 A quick sidebar: It’s hard to overlook the fact that while “Vice” is brutal in its depiction of Cheney, the way it looks at his wife Lynne could be considered downright demonic. The film makes subtle but hardly dismissible claims that every decision and every move to gain power by Cheney was done for —and at the direction of — his wife. At one point in the film she outright states, “I’m a woman and there is only so high that I can go — are you man enough to help me or should I leave now?” This sort of framing is obviously concerning because it seems to put the onus of responsibility on Lynne rather than the man committing these atrocities. Securing himself a congressional internship with Donald Rumsfeld (Steve Carell), Cheney gets his master class in government schooling within Nixon’s White House, a place where idealism and civic duty is openly mocked and where he also comes to understand that true power is exercised behind closed doors by people who are accountable to no one. What follows is a fast-moving jumble of grim farce, satirical stunts, fourth-wall-breaking absurdity (including a narrator that becomes the film’s darkest joke), countless mixed metaphors and plenty of indignation as McKay builds to his case that Cheney’s puppet-master-like pursuit of an imperial presidency had terrible consequences for everyone, even his own openly gay daughter (Alison Pill). At its center is Bale’s incredible transformation. Perhaps his most impressive yet, disappearing before very eyes and reappearing as a man who, as the movie tells us, changed the course of history forever. Bale manages to simultaneously evoke Jon Stewart’s parody of Cheney as a Penguin-esque Batman super-villain while also playing this most secretive, intractable and inarticulate of men with occasional flashes of humanity that somehow makes him even more disturbing and monstrous.